Print is Dead - Or is It? 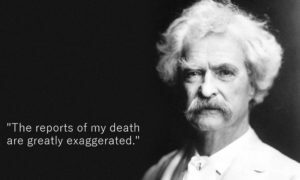 Legend has it that In 1897, Samuel Clemens – better known as Mark Twain – was on a lengthy, worldwide speaking tour when rumors he was gravely ill began to spread back home in the U.S. The same could be said about print. While the impact of online advertising is undeniable, print is still alive and well and for a number of very good reasons. Far from dead, print is evolving to meet the wants and needs of businesses and consumers. A number of recent studies have shown that consumers are suffering from digital overload. The sheer amount of digital content people are exposed to on a daily basis is causing consumers to simply tune much of it out. In-app and newsfeed advertising has become increasingly distracting, and consumers’ attention span is shrinking. While digital devices are convenient, most consumers still enjoy the sensory experience of actually holding printed materials in their hands. Printed materials can have different textures and aren’t subject to the size limitations of a smartphone or computer screen. Researchers recently found that print advertising is also more effective at evoking an emotional response. A 2015 study by the United States Postal Service’s Office of the Inspector General (OIG) found that printed ads evoke a higher perceived value than digital ads which makes people more inclined to purchase the products or services being advertised. While it’s obvious that digital advertising isn’t going away, it’s equally obvious that the same is true for print. The key for any successful advertiser is reaching the right balance to get the best possible ROI for their advertising dollars. Fortunately, any reputable commercial printer will work with you to achieve this goal. To learn how print can benefit your business, call Brumley Printing Company at 817-336-5551.